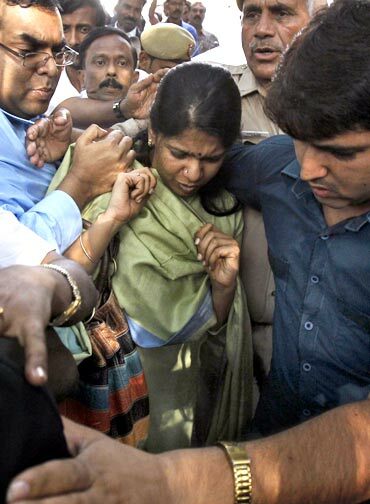 After spending 193 days in Delhi's Tihar Jail following her arrest in the 2G case, Dravida Munnetra Kazhagam member of Parliament Kanimozhi returned in Chennai on Saturday to a rousing reception by the party cadres. Kanimozhi, accompanied by husband Aravindan and son Aditya, was received at the airport by her 87-year old father and DMK President M Karunanidhi and step brother M K Stalin among others. Kanimozhi's mother Rajathi Ammal, Karunanidhi's wife and director of Kalaingar TV Dayalu Ammal, her daughter Selvi also welcomed her at the airport. Hundreds of party cadres broke into celebrations beating drums and dancing as the DMK MP stepped out of the airport to join the family members after more than six months of incarceration. They also carried placards hailing Kanimozhi as "Chennai Sangamame varuga varuga (welcome)", in a reference to the annual cultural show organised by her during Pongal festivities. DMK party flags and banners with pictures of Kanimozhi and Karunanidhi were lined up along the road leading to the airport. Kanimozhi, who was granted bail by the Delhi high court, told reporters at Delhi airport before boarding the flight to Chennai that she would prove her innocence in the court and termed grant of bail to her as the "first step". "I am very happy to be going back (to Chennai). I am looking forward to my visit in Chennai. We are all happy that finally people are getting bail in the case. 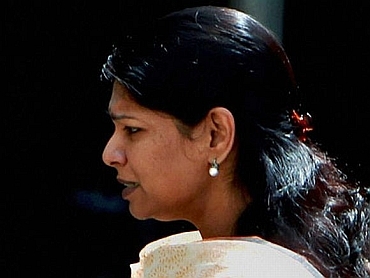 This is the first step," Kanimozhi told the media in New Delhi before boarding a flight to Chennai. Asked about her next step, the DMK Rajya Sabha member said, "I have to prove my innocence and face the case legally and get out of it.I am confident of doing this." The 43-year-old MP was arrested on May 20 by the Central Bureau of Investigation in connection with alleged payment of Rs 200 crores by the DB Group to DMK-run Kalaignar TV in which she is one of the directors. After denial of bail by the trial court, high court and the Supreme court on earlier occasions, Kanimozhi was finally granted the relief by the high court on November 28. 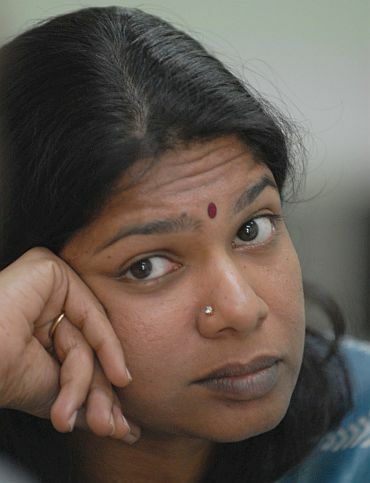 Since she had to attend the court proceedings in the next few days, Kanimozhi chose to stay back in Delhi and arrived in Chennai on Saturday. Besides Kanimozhi, others granted bail by the high court are Kalaignar TV MD Sharad Kumar, Bollywood filmmaker Karim Morani and Kusegaon Fruits and vegetables Pvt Ltd directors Rajiv Aggarwal and Asif Balwa.